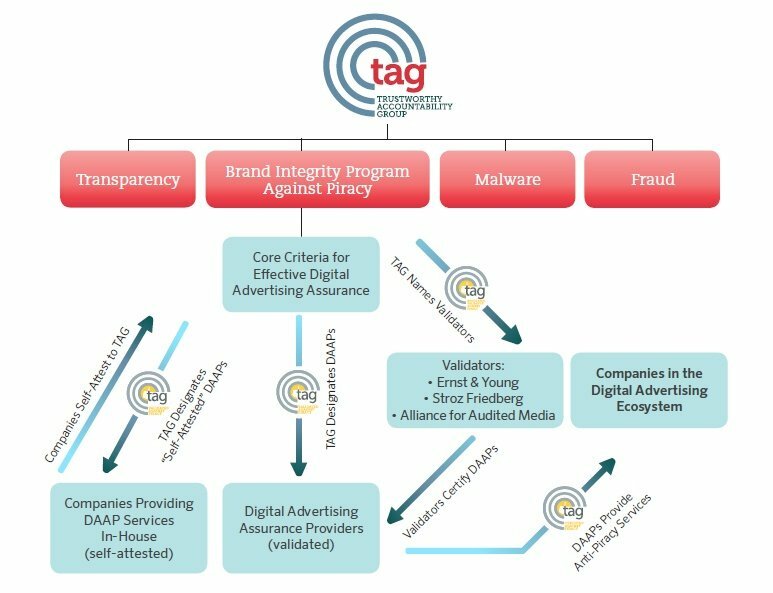 Washington, DC – October 5, 2017 – The Trustworthy Accountability Group (TAG), an advertising industry initiative to fight criminal activity in the digital advertising supply chain, today released a new study – “Measuring Digital Advertising Revenue to Infringing Sites” – showing the impact of industry efforts to reduce ad-supported content piracy. The study found that anti-piracy steps taken by the digital advertising industry have reduced ad revenue for pirate sites by between 48 and 61 percent, notable progress against the $2.4 billion problem of infringing content. Digital ad revenue linked to infringing content was estimated at $111 million last year, the majority of which (83 percent) came from non-premium advertisers. Ongoing industry efforts against piracy have therefore reduced the advertising revenue of pirate sites by 48 to 61 percent. TAG commissioned Ernst & Young LLP’s Media & Entertainment Advisory practice to perform a benchmarking study of the US market, with two objectives: estimating the annual revenue that piracy operations earn from digital ads served linked to copyright-infringed content and estimating the financial impact of the quality control steps taken by the digital ad industry to address this area. EY conducted this study independently on behalf of TAG between July 2016 and July 2017. The data used in the study were provided by various digital advertising ecosystem participants. Sixteen companies have now earned the TAG “Certified Against Piracy” Seal, an assurance that the anti-piracy services provided by those companies meet stringent requirements and industry best practices. Seal recipients include ten companies approved by independent auditors and six that underwent a self-attestation process. More than 50 leading brands and advertising agencies - including all four of the world’s largest ad agency holding companies - have signed the TAG anti-piracy pledge to take “commercially reasonable steps” to reduce ad supported piracy, such as working with companies that have received TAG’s Certified Against Piracy seal. "This represents real progress,” said John Montgomery, EVP Global Brand Safety, GroupM. “Many people have put a lot of hard work into getting us to this stage, and these findings will surely encourage the entire digital sell- and buy-sides to divert advertising away from IP infringing sites so that we can protect content creators and brands from this type of fraud." “As representatives of the creative community active in alerting brands when their ads appear on infringing sites, we commend advertisers, ad agencies, and ad networks that take effective action to ensure good ads don’t appear on pirate sites, cutting off revenue to those sites,” said CreativeFuture CEO Ruth Vitale. “We urge everyone in the advertising ecosystem to increase efforts to protect not only the reputation of brands, but also the millions of creatives who contribute so much to our society and economy." More information about TAG’s Certified Against Piracy Program and how companies from across the advertising ecosystem can received the TAG “Certified Against Piracy” Seal can be found at www.tagtoday.net/piracy.